Spitsbergen wildlife cruises. Helping Dreamers Do. More info:Price depends on cabin/berth chosen and departure date. Please ask for details. Staff & Crew Our crew and expedition team act as stewards of the environment and are well versed in the strict environmental protocols on board and on land. All of our travelers are thoroughly briefed in these protocols before being allowed to participate in excursions and are always supervised by our team when on shore. Expedition Auctions At the end of every M/S Expedition departure, we raffle our Captain’s Sea Chart together with expedition books signed by the staff, the flag from the bow of the ship and many other items as souvenirs of the voyage. All proceeds are then donated through Planeterra to support the Bear Health project and the Save the Albatross campaign. Rechargeable Batteries We provide battery chargers and rechargeable batteries on the ship for use by our travelers as a way to decrease the consumption of batteries and their harmful effects on the environment. Recycled non-chlorine bleached paper In an attempt to reduce the amount of dioxins released into the environment through paper production, the ship has been stocked with recycled, non-chlorine bleached paper and toilet paper. There were a few! The polar bears that we saw close up from the zodiac, the large group of walruses with some playing in the water, the bird cliff at Alkefjellet and the polar bear that came looking for tea, the glacier calving at Monacobreen with the pod of around 12 Belugas that turned up to watch, being able to swim in the Arctic, and, my personal favourite, sailing through the pack ice to 82 degrees north and being surrounded by ice. 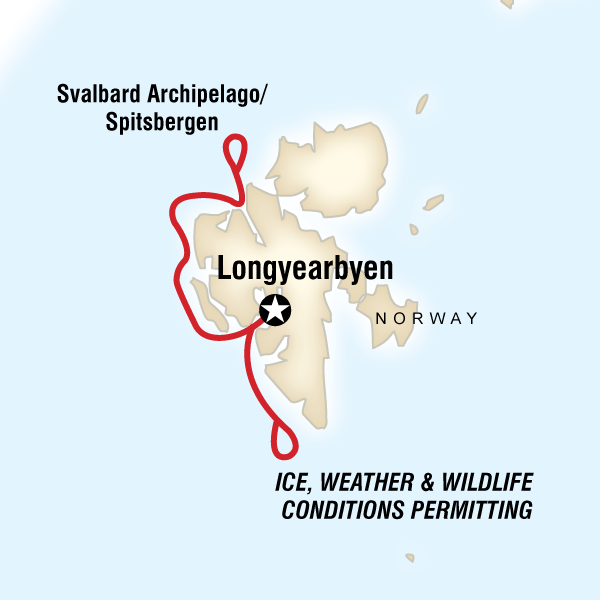 Don’t miss out on being on land at Svalbard. The walks from the boat are minimal so to really experience the wilderness, stay on land as well and get some hiking done.Don’t miss out on the lectures! The CE(xperience)O’s are very knowledgable and make them fun. Have good long lenses and/or binoculars, there is a lot to see up close, but even more further away! Spend as much time as weather permits outside just looking! You never know what you might see! Don’t overfret about outer layers, the jacket is amazing and the waterproof boots provided excellent, but some good waterproof trousers are essential on the zodiacs. And good thermals are ideal. Yes, where possible. There were no plastic bottles on board with reusable bottles being given. We spent an hour or so picking up plastic from one of the beaches - yes, it is a big problem in the Arctic too! Sadly, a polar bear was shot in the vicinity when we were there. The practices followed by the boat were incredibly thorough to keep staff, passengers and wildlife safe and well, and to interfere as little as possible given the trip intent. I cannot comment on the incident, but it is vital as tourism increases that best practices are always followed. Very special. The CEO’s did a fantastic job to give us the wonderful experience and they were ably supported by the whole crew who did everything they could to make the whole trip feel special. There were no moments that overshadowed everything else. There were many very memorable times and sights. I particularly enjoyed the walks and would have preferred more and longer walks. The advice received from the operator was sufficient and pertinent. Only to a small extent. The organisers were very particular about not having adverse environmental effect. Cruising is not my scene but this one was certainly very interesting and informative. The organization, comfort and activity were excellent and I could certainly find no fault with anything. If I rate it less than 5 star it is only because, for me, I prefer something with more action and less comfort. As highlights, I would say the many many wildlife that we saw (over 30 polar bears! arctic deer, arctic fox, hundreds of walruses, seals and birds) and that we were able to sail all the way almost to the North Pole (just 800 km away!). And the most amazing thing of the trip is that on this deserted ice landscape (third day of the trip), we were able to track and "chase" a fat polar bear that was swimming, walking and jumping back into the water and back to ice constantly. This was an incredible experience on a nice sunny day. In addition, the ship was surprisingly comfortable, and the crew, staff and scouts were super friendly and very experienced/ knowledgeable. I would highlight that this is more of a luxurious cruise than an adventurous expedition. The overall style of the trip is a very comfortable cruise; there is plenty of quality food (both buffet and 4 course meals), rooms are very comfortable and cleaned/ serviced constantly, and the excursions are organized around the meals for an easy execution (breakfast, 2 hour excursion in the morning, lunch and a nap, 2 hour excursion in the evening, back for dinner). So keep in mind that this is an easy and comfortable trip, where one gets to rest a lot, eat very good and have the amazing opportunity to see plenty of wildlife and incredible landscapes. In conclusion, it is more of a luxurious and comfortable cruise rather than an adventurous expedition. Overall it was an amazing experience where we got what we were looking for; plenty of wildlife (polar bears!!) and ice landscapes. Seeing a mother polar bear and her two cubs walking on the ice floes walking along them then diving in and swimming to the next one. The cubs following on behind her. Fabulous! Be warm but also have some smart casual clothes to wear in the evening. When inside of the boat you can be relatively warm - have those layers for going out on deck where it can be cooler but you can watch the midnight sun or enjoy the on deck BBQ. If you want good photographs make sure you have a camera with long range focus as you are often at a distance from the wildlife so as not to disturb them. Take your swimming gear as you do get the opportunity to swim in arctic waters - everyone that did did survive! Mobile phone signal is lost once you come out of the fjord and into the sea - there is a possibility to set up an email system with reception but this can be costly. Remember that this is an extreme part of the world where nature rules and that anything can happen and sometimes it does. Yes. We shopped in Longyearbyen and had snacks there some people stayed in the hotels there too. We were advised that we could not remove anything from the island by way of stones, bones, or remove any plants to take home. We were asked to bring biodegradable products to use. We always kept at a distance from the wildlife in order to not stress them and allow them to go about their daily life as usual. Excellent. The team leaders are very knowledgeable and the trips out were well organised and we were well guarded by perimeter sentries in case a polar bear should arrive. We were very well fed and with lots of choices - be prepared to put on weight! The cabins were spacious and our cabin crew were great at tidying us up and keeping our cabin shipshape. There were safety boxes freely available at reception. I didn't use one and didn't feel the need too which was very nice. Fellow passengers were really good fun and added to the whole experience - it gets you talking more travel.